There are a multitude of browsers that you can find right now on the market and, as a developer, you have to make sure that you test the site you created on as many as possible. However, you simply cannot test all existing browsers on all possible platforms. Because of that you need access to tools that will help you perform the browser testing in a thorough manner and efficient manner. We have created a list with some applications that will enable you to test your site easily on a multitude of browsers and devices without too much hassle. This tool is offering you synchronized testing for things such as reloads, clicks, scrolls, as well as the web page on its own. Thanks to Ghostlab you have the opportunity to check the whole user experience, which is very interesting to say the least. Thanks to the server app that is included in the package, you can sync your pages to the local directory or the localhost without any issues. The application also makes it easy for you to access a workspace feature that provides custom browser setup as well. Because of that, Ghostlab is reliable, fast and the fact that it doesn’t require any setup makes the whole experience even more seamless than expected. This tool provides support for more than 300 different browser, doesn’t require any installation and even comes with numerous tools that are valuable for developers, such as the Microsoft Script Debugger, Firebug Lite as well as many others. Thanks to it, you can see how your site looks and behaves in a live manner, without virtual machines! Sauce labs comes with an interesting infrastructure created specifically for testing, which includes complete support for more than 260 different browsers. The best thing about it is that it provides the ability to jump in while tests are running. This allows you want to take control over the investigation or deal with a problem in a more timely manner. 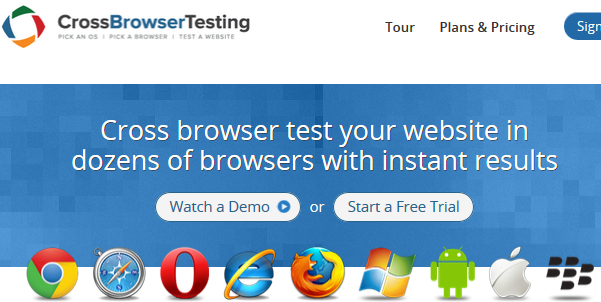 CrossBrowserTesting offers close to 1000 different combinations of browsers, plugins and operating systems, which means that you will always have the opportunity to test your site in any way you want. Moreover, it comes with live testing, mobile platform support, testing behind logins, snapshot and video recording support, as well as localhost support and automatic screenshots. Browsershots is an open source tool that allows you to perform browser compatibility tests and browsers right from your own browser without any hassle. It also comes with added features in the form of a web design gallery and an icon search engine that is very easy to use. Browserling is designed upon StackVM and allows you to run browser tests that are fully interactive, without any applets or necessary plugins to install. All you need is to select the site to test and the browser and its version. You have 80 browser combinations to select, multiple screen resolutions to choose from as well as numerous other things to do. The whole browsing process is safe as you can access SSH tunnels for your local testing needs. The fact that you perform anonymous browsing just increases the overall security of the whole process. Litmus performs fast and provides a reliable browser testing experience. You can even use it to verify all links as well. Litmus even works seamlessly with the Mac OS X app Alkaline which makes the whole browser verification on a Mac much faster and reliable as well. In conclusion, as a developer, you have a multitude of tools that can be used in order to successfully test the sites you are working on. Reliable, fast and with great pricing, all services included in this list are very easy to use, so you might want to check them out right away!